Interstate 10 is a study of contrasts through Texas. Covering 881 miles, the longest interstate in the Lone Star State travels from the scrubby deserts of El Paso to the bayous of Orange. The drive is quite memorable, if nothing else for the sheer length of time it takes to drive. Interstate 10 enters Texas at the New Mexico border, in the town of Anthony, co-signed with US 180. It proceeds south from there along the Rio Grande, keeping in a narrow strip of land between the river to the west and the Franklin Mountains to the east. Curving through Downtown El Paso, this section of Interstate 10 is congested, with widening and reconstruction taking place several times since its original opening. US 180 leaves the freeway east of Downtown. Southeast of El Paso, traffic dies down and the freeway narrows to two lanes each direction. The next 500 miles until San Antonio are some of the most desolate stretches of freeway anywhere in the nation. IH 10 continues to parallel the Rio Grande for another 40 miles before turning east and climbing into the Sierra Blanca and Davis Mountains. The town of Van Horn is a historic railroad and roadway junction, and is the beginning of US 90. US 90 swings south into Big Bend country before rejoining IH 10 in San Antonio. Van Horn today holds some of the few traveler amenities anywhere along IH 10 in West Texas. 30 miles east of Van Horn, Interstate 20 branches northward from IH 10. This junction marks the split between old US 80, which was replaced by IH 20, and the former western extent of US 290, which emerges from IH 10 further east en route to Austin and Houston. Old US 290 was replaced by IH 10 in West Texas to Kimble County. Traffic favors IH 20 slightly more than IH 10, with 2015 TxDOT traffic counts noting 6,227 vehicles per day (vpd) along Interstate 20 and 5,208 vpd along Interstate 10 beyond their split. 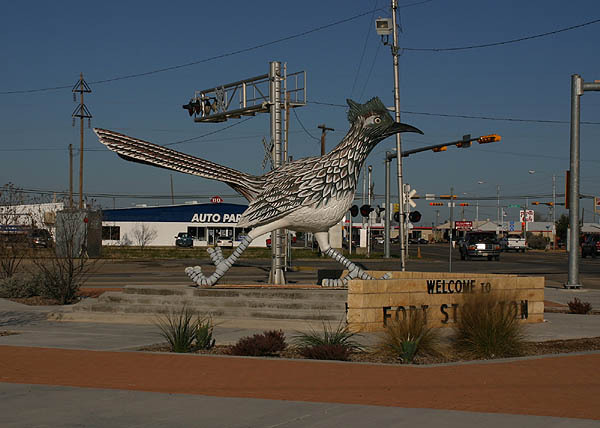 Fort Stockton is known for Paisano Pete, a large roadrunner statue in the middle of town. Photo taken by Kevin Trinkle (February 27, 2006). The second to last section of IH 10 in Texas built was the Sheffield bypass. Old US 290 navigated along a winding course around the Pecos river, while IH 10 provides a more linear route to the north. Old US 290 remains driveable through Sheffield, and is marked as SH 290. Continuing through range and oil country, IH 10 enters Ozona in Crockett County. Ozona is the only unincorporated county seat in Texas. Closer to Sonora, IH 10 enters the eastern fringes of Hill Country. Hill Country is a landscape comprised of limestone hills, Live Oak trees and rolling grasslands. Most of south central Texas obtains its water from the Hill Country, which IH 10 traverses for approximately 150 miles to San Antonio. Just to the west of Sonora are the Caverns of Sonora, a noted landmark and home to some unique geology, including a natural butterfly formation. Interstate 10 turns southeast and separates from US 290, 16 miles east of Junction. While US 290 travels east to Austin and northwest Houston, eventually terminating at IH 610 in Houston, IH 10 continues southeast to follow the route of old SH 27 through Kerrville and Comfort, where it combines with US 87. The section of IH 10 between Comfort and San Antonio is co-signed with US 87, and passes through the city of Boerne, which grew 130% in population from 2000 to 2016. As San Antonio expanded northward, Boerne became a bedroom community, with newer subdivisions mixed in with farmhouses. Traffic counts along Interstate 10 double at Boerne and steadily increase southward to Fair Oaks Ranch and the northwest side of San Antonio. The San Antonio metropolitan area is the third largest in Texas. The city is best known for the Alamo, located in the heart of Downtown, but also features the Riverwalk as well as being headquarters for SBC. San Antonio is unique for being totally reliant on the Edwards Aquifer, which is fed from the Hill Country and emerges as the San Antonio River through Downtown. IH 10 passes through the heavily developed northwest side of the city, passing the large USAA campus before reaching Loop 410 with 2015 traffic counts of 244,459 vpd. The original Loop 410 (west) interchange was rebuilt in 2005-07, from a six lane configuration, with left-hand exits, to a five level stack to serve the explosive growth of the northwest side. Inbound from Loop 410, the original four lane US 87 freeway was rebuilt in the early 1990s to a double-deck configuration, fitting additional lanes in the narrow right-of-way. Through central San Antonio, IH 10 forms the west and south sides of the Downtown loop. The west side is double-decked and co-signed with IH 35. It ends at a four level interchange with US 90 from the west. US 90 and IH 10 overlap or closely parallel each other east from their merge in San Antonio to Jacksonville, Florida, with the exception of between Lafayette and New Orleans in Louisiana. Traveling east from San Antonio, Interstate 10 emerges through the flat plains of South Texas. Traffic counts reduce to the low 30,000 vpd range on the drive east from Sequin to Columbus. IH 10 through here was completed by 1972, due to traffic in the "Texas Triangle" between Houston and San Antonio (the other leg of the triangle being Dallas). Interstate 10 passes through Seguin, Luling, Columbus, and Sealy, before reaching the coastal plains approaching Katy. Once at Sealy, the freeway expands to six lanes as it approaches the Houston metropolitan area. The city of Katy is a suburb of Houston where the population doubled from 1990 to 2015 with rapid area growth. Traffic counts jump to 100,000 vpd and congestion ensues along IH 10 east of Katy. Seemingly perpetual reconstruction to keep pace with the rapid growth led to expansion of IH 10 to ten lanes with express toll lanes. The tight four-level stack with the Sam Houston Tollway (Beltway 8) was rebuilt in 2007-08, as it has reached obsolecence many years before it was designed to. Passing Loop 610, IH 10 enters Downtown Houston. The freeway continues with ten lanes, and the HOV lane ends as IH 10 approaches IH 45. Through the lengthy IH 10 / IH 45 interchange, IH 45 runs in what would be an extended median between the east and west-bound roadways of IH 10. Passing IH 45, IH 10 goes through several lane shifts for through traffic, due to left-hand exits, before reaching IH 69 & US 59 on the east side of Downtown. Meeting Loop 610 and the Sam Houston Parkway (Beltway 8) on the east side of Houston, IH 10 presses east toward Baytown, carrying significant traffic to Beaumont and New Orleans. Leaving Baytown, IH 10 leaves urbanization and traverses coastal plains through Anahuac, before entering the Piney Woods of East Texas and Bayou country. Located in the middle of this is Beaumont, the last major city along IH 10 in Texas. The section between Houston and Beaumont follows former SH 73, with US 90 taking a more northerly track to reach Beaumont. Twenty miles after Beaumont is Orange and the Sabine River. On the high bridge above the Sabine River, 881 miles after entering Texas, IH 10 enters Louisiana. 1959: IH 10 commissioned across Texas. 1960: IH 10 open from Houston city limits to Winnie, except for the bypass of San Jacinto. In West Texas, IH 10 is complete from the New Mexico state line to the El Paso city limits and 15 miles west of Van Horn to Van Horn (as conversions of US 80 and SH 73 multi-lane highway). 1964: IH 10 completed from New Mexico state line to Mesa Street in El Paso, then east of Downtown El Paso to 10 miles west of Sierra Blanca, and from Beckmann north of San Antonio to Seguin. Columbus bypass open. Road complete from Houston at US 90 (east) to Orange. 1965: IH 10 completed from US 59 in Houston east to Louisiana. In West Texas, IH 10 is completed from New Mexico to Mesa Street in El Paso, and east of Downtown El Paso to Van Horn. IH 10 is completed from Loop 410 to downtown and from East Loop 410 to 15 miles west of Seguin. 1966: Various sections between Balmorhea and Ft. Stockton converted to freeway. Freeway opened between Boerne and Leon Springs, with a one mile section uncompleted between Leon Springs and Beckmann. Freeway completed between Glidden and Loop 610 west in Houston. 1969: IH 10 is completed from New Mexico to Van Horn (with the exception of 0.4 miles through downtown El Paso), from Ozona to Sonora, Boerne to Seguin, Engle to IH 45, and US 59 to Louisiana. The downtown El Paso section is opened in July. 1972: IH 45 to US 59 link opens in Houston, completing IH 10 east of San Antonio. 1976: IH 10 completed from El Paso to 5 miles east of Balmorhea, 20 miles west of Fort Stockton to Bakersfield, and 5 miles west of Ozona to Sonora. The Junction bypass to US 290/IH 10 split, and Mountain Home to Louisiana sections are complete. 1980: Uncompleted sections are 5 miles east of Balmorhea to 20 miles west of Fort Stockton, the Fort Stockton bypass, Sheffield bypass, and sections between Sonora and Junction. 1981: Road completed between Sonora and Junction. 1982: Only uncompleted section is the Fort Stockton bypass. 1987: Reconstruction begins of IH 10 in San Antonio from Loop 410 (west) to US 90. 2004: Reconstruction of IH 10 in Houston from SH 99 to IH 610 West begins. These FM 155 shields face departing traffic from Interstate 10 westbound. Northward FM 155 travels to U.S. 77 at La Grange, the county seat of Fayette County. Photo taken 12/30/02. FM 155 continues south of Schulenburg to U.S. 90 Alternate near Sheridan. U.S. 90 travels through Downtown Schulenburg independent of Interstate 10 to the north, only to return to the freeway just three miles to the east. Photo taken 12/30/02. 102 miles to the east at Schulenburg is this Interstate 10 shield assembly on FM 155 southbound. The city center lies just north of Exit 682. Photo taken 12/30/02.